Dougie Sharpe is fifth in the Queen of the South appearances table with 431 first team league and cup games. A tough tackling right back, his quality performances were recognised at international level when he played for the Scottish League. Sharpe next joined local amateur side Greystone Rovers. On amateur terms in the last season before World War II, the native of New Abbey joined the club that was to become his football sweetheart, Queen of the South. However the war meant his football career was put on hold as he joined the RAF serving in North Africa. When the war had ended Sharpe rejoined Queens in 1946 and was soon on professional terms. Among the very finest full-backs to have played for QoS, Sharpe always played with great passion and gave 100%. He debuted at left half but was soon switched to the position that he is always remembered for - right back. Sharpe played for Queens with distinction until the end of the following decade under the management of Jimmy McKinnell Junior, the most successful manager in Queens’ history. 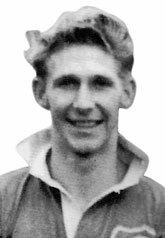 Dougie Sharpe’s fine performances were recognised with a call up in February 1952 to represent Scotland v The Army in Newcastle. Fate intervened when Sharpe was unable to play having suffered concussion against Hearts the week before. However his time would come the following Autumn in Belfast. On 3rd September 1952 Sharpe lined for the Scottish League versus the Irish League. The Scots won 5-1 with goals by Willie Ormond (2), Lawrie Reilly (2) and Ian McColl. Great names in Queens’ history were already in the side when young Sharpe broke into the first team in the late forties, most notably Roy Henderson and Billy Houliston. Houliston’s career was curtailed after he picked up an injury when at his peak in 1950. Thus with Henderson in particular, Sharpe went on to enjoy many of the greatest moments in Queen of the South history. 1948/49 saw Queens finish in tenth spot, the decade’s best for QoS. 1950 was the year of the semi final appearance in the Scottish Cup but also the misery of the relegation from the top tier. 1951 was the rubber like bounce back to the top flight as ‘B’ Division champions with a League Cup semi final thrown in. Among the new names signed for the return to the top division was a player often quoted with Dougie Sharpe as forming the finest full back partnership in Queens’ history, Jimmy Binning. Together they were cornerstones of the Queens defence for the next seven years. Three more 10th place finishes were racked up in their first three seasons together. In 1952 Queens signed a winger to give Sharpe a new partner down the right hand side, Bobby Black. This is how Black summed up his team mate’s playing style. "He wasn’t a big man, he was no bigger than me. He was just a ferocious tackler." "He was one of the boys. He, Roy Henderson and I were a trio, a triumvirate, call it what you like," Black said. "You three were the masters of mischief?" "That’s a good way of putting it actually. He managed to beat Henderson more times than most of the opposition did," laughed Black. "It became a bit of a joke as it wound its way into history. He was ‘proud’ of them." In Sharpe’s time in the side the best season was 1955/56. As in two seasons before, Queens started the league campaign by leading the field. After four games Queens were top with six points including a 4-3 win against Hearts and emphatically dishing out a 6-0 gubbing to Falkirk at Palmerston. A 3-2 defeat at reigning champions Aberdeen knocked Queens off top spot. However after nine games Queens again returned to the top spot with a 2-1 win against Rangers – six wins and a draw giving a tally of 13 points out of 18. Queens spell at the top was short but they still enjoyed some other highly respectable results that season. A 2-2 draw at Tynecastle, 2-2 against Aberdeen at Palmerston, and at least three Queens goals were scored in the home wins against Airdrie, Clyde, Dunfermline, Partick Thistle, St Mirren and Stirling. Motherwell had a talented new manager at the start of his 10 year reign at the club, ex Scotland left back, Bobby Ancell from Dumfries. Ancell was another manager left with no choice but to respect Queens that season - Motherwell drew 0-0 at Palmerston but lost 3-1 at Fir Park. Queens’ season was rounded off with a 3-1 win at the ground of a team against whom they had enjoyed so much success against since the Doonhamers promotion in 1933, Celtic. Of the teams who finished above Queens, in the end Rangers were clear winners. Previous champions Aberdeen (now without manager Dave Halliday) were unable to maintain the form of the season before and finished second. Hearts and Hibs finished on level points as their fortunes were about to go in opposite directions. The greatest Hibs side in history by the length of Easter Road was breaking up. The greatest Hearts side in history by the length of Gorgie Road was about to become consistent title challengers. Fifth placed Celtic were a decade away from Jock Stein bringing back league success to Parkhead. 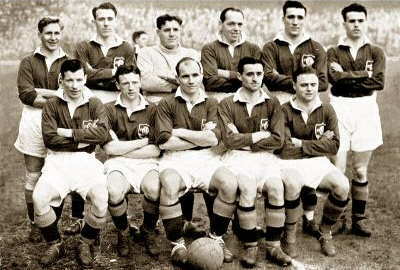 With the peak of the Queens side of the 1950s equalling the side of 1938/39, the club achieved their third and to date last finish in the top six of Scottish Football in 1955/56. Dougie Sharpe was with Queen of the South for 20 war interrupted years where he played 431 times. This places Sharpe fifth in the appearances list in Queens history behind Allan Ball, Iain McChesney, and two other Queens legends from the 50s like Sharpe, Jim Patterson and Jackie Oakes. Queens other finest achievements with Sharpe in the side are listed in the Queens Legends articles on Billy Houliston, Bobby Black, Jim Patterson and Jimmy Binning. At the age of only 48 Dougie Sharpe passed away in 1974.